The Synthesizer Sympathizer: Jupiter-8V2 Review - How does the Jupiter stand up with a fresh pair of 64-bit legs? Jupiter-8V2 Review - How does the Jupiter stand up with a fresh pair of 64-bit legs? From the upgraded collection of the Arturia plugins comes another vintage synth, the Jupiter-8V2. 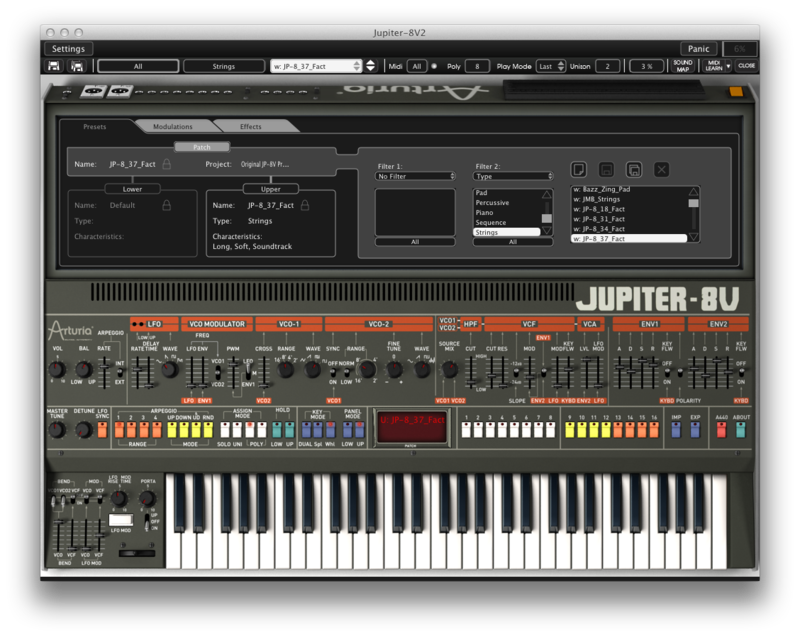 The Jupiter-8 is, again, regarded as one of the classic and legendary 80s synths. A quick look on eBay will show you that right now, these are hot, going for as high as $8,000, which is money you could build an entire studio with. The Roland Jupiter-8 was first released in 1981 and was Roland's first great synth. It offered all the bells and whistles of the time-- it was multitimbral, it had an arpeggiator, dual oscillators for each of the 8 voices, and two envelopes. These are pretty standard and almost expected today, but at the time, it was an important step forward. Roland filters have always had a unique sound to them, and the Jupiter-8 is no different, being the favorite for many who are making string sounds. Of course, it does many other fantastic sounds as well. The virtual version I have in front of me is no different in terms of functionality from the original. As with the Prophet-V2, it looks the same as the original, too. The plugin's features include the two oscillators, which have various waves like triangle, sawtooth, pulse, square, noise, and sine, a high pass filter, low pass filter, the two envelopes, the arpeggiator, the LFO, modulation parameters, and the split modes. In addition to these features included on the original synth, there is also a special modulation section above, which includes a 2-dimensional pad to edit parameters, a sequencer, and keyboard velocity and after touch modification. There is also a selection of effects that can be placed in between elements of the synth-- for example, you can place one effect on the VCO before it reaches the filter. The effects include Chorus/Flanger, Distortion, Param EQ, Phaser, Delay, Reverb, and Ring Mod. There are a ton of presets to choose from, all categorized by characteristic, and you can cross-search to find even more specific patches-- for example, "Funky" and "Bass" leads you to a nice selection of classic funk basses. I actually find this incredibly useful for such a large selection of presets, because it can stifle creativity when you've got a track open, you're thinking of a specific but not uncommon sound, and you're clicking down a list of 100 "pad" or "lead" sounds. By cross searching, you cut down the search to about a fifth of what it was in some cases, and the sounds are good so there's not much more searching to be done afterward. As I write this, I'm playing with it, and I absolutely love the way the arpeggiator sounds with basses. This synth has incredible tone for the low end, and when you put an arp it on, it reminds me of so many great dance hits. It's no wonder that the original was used by the likes of Prince, Yes, Toto, and Simple Minds, to name a few. The synth also wonderfully compliments itself, so it works quite well to layer it, or use it for both a bass and a string sound in one track. 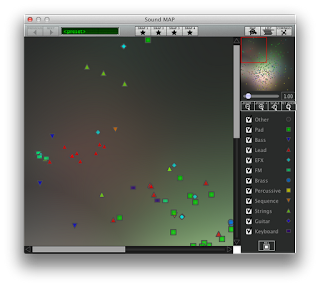 The effects help fill out the sound to full quality, so you might even be able to skip some of your later DAW effects. I'm also particularly fond of the brass presets on the Jupiter-8V2. There are about 20 presets to choose from, and almost all of them are track ready, and very perfect for 80s sounding tracks. There's warmth, and with chorus, they can fill space in a track very nicely. At the current price point of $100, I think this is an absolute steal, much like its brother in the series, the Prophet-V2. I know it doesn't mean much either, but it does really well with the CPU on my old mac, so a newer computer would have no problem with it, so you could layer a ton of these and they would sound great. As far as other complaints, there aren't many that can't be blamed on the original synth-- I find the Jupiter-8V2's modulation controls aren't quite as clear as the Prophet's. Overall, I feel the Arturia Jupiter-8V2 absolutely delivers on those vintage sounds, despite this plugin being one of Arturia's early emulations. With 64 bit under the hood, it works even better. The sounds are absolutely reminiscent of the original, for such a fraction of the price. What are your waiting for? Buy or demo the Jupiter-8V2 here, or pick up the entire V collection here for an even greater value.